Dedicated in 1927 to honor 10,000 citizens of Hawai’i who served in World War I, the natatorium was conceived as more than a war memorial. The salt water swimming pool on the beach of Waikīkī once served as a living memorial for people to take part in its long history of indigenous swimming traditions and its Olympic legacy. Designed by renowned architect Lewis Hobart, the natatorium features a grand Beaux-Arts archway leading to its ocean-water swim basin. The archway, as well as the monument’s bleachers and bathhouses, include classical ornamentation such as friezes, pediments, statuary, and cornices. Today, the memorial, which is currently closed to the public, is one of only a few ocean-water natatoriums left in the world, and the only one of its kind in the United States. Along with a handful of other prominent structures that remain from the early 20th century, the natatorium represents a distinct moment in the history of Hawai’i. The memorial was constructed during a 1920s building boom, after the “Big Five” sugar companies established their footholds in Hawai’i and the territory’s population soared. Many of the major structures built in Honolulu during the ‘20s were designed as monuments to the state’s military and economic significance, and they often became symbolic of America’s democratic principles. While these places resembled similar Beaux-Arts buildings in the continental United States, the Natatorium is a rare contemporary example of the architectural style in Hawa’i. The natatorium served as the epicenter of swimming and watersports heritage in Hawai’i for about 50 years. When it opened on August 24, 1927, Olympic Gold Medalist and “father of modern surfing” Duke Kahanamoku dove into the pool to take the first ceremonial swim. It hosted celebrity swimmers like Esther Williams, Buster Crabbe, Johnny Weissmuller, and 34 members of the International Swimming Hall of Fame. Generations of families learned to swim at the natatorium, as the Hawai’i Department of Education used the pool for its mandatory elementary Learn to Swim Program. On their own, these layers are important enough, but taken together they epitomize the emergence of the state’s international identity as “the crossroads of the Pacific.” It’s this dynamic between grand memorial and beloved public amenity that cements the natatorium as a one-of-a-kind place. Despite its popularity, the natatorium began to deteriorate after the end of World War II. 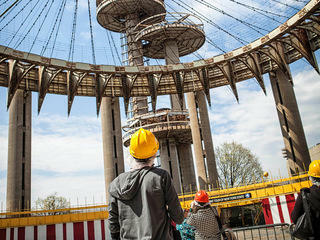 The memorial was declared unsafe in 1979, and the swimming area and bleachers were indefinitely closed to the public. 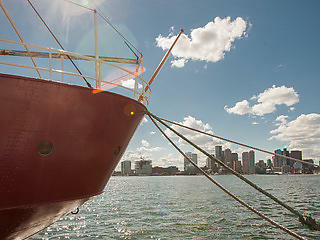 It was listed on the National Trust’s list of America’s 11 Most Endangered Historic Places in 1995. In spite of the natatorium’s compromised structural integrity, a 1997 study concluded that restoration with a re-engineered pool was the most sensitive option for the memorial. In 2001, the exterior facade, locker rooms, lifeguard offices, volleyball court, and parking lot were repaired and reopened to the public. Restoration of the bleachers and saltwater pool, however, was put on hold. The saltwater pool, though once an icon of swimming and watersports heritage in Hawai'i, is currently crumbling away into the sea. The Beaux-Arts archway, bleachers, and bathhouses have been fully restored. Restricted water floor and poor water quality prevent the swimming pool from being safe for all to enjoy. 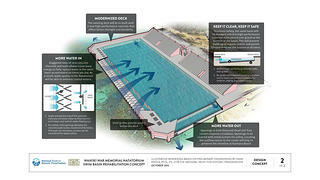 This diagram outlines a potential solution for the natatorium. The National Trust designated the natatorium a National Treasure in 2014, acknowledging its layers of significance as a living memorial, hub of water recreation, and architectural treasure. The National Trust has worked in the years since with our partners, the Friends of the Natatorium, Historic Hawai’i Foundation, and the World War I Centennial Commission, to advocate for the restoration and reuse of the memorial. On November 8, 2018, the City of Honolulu released an environmental impact statement, which defines as its proposed action the rehabilitation of the natatorium in accordance with accepted preservation standards. 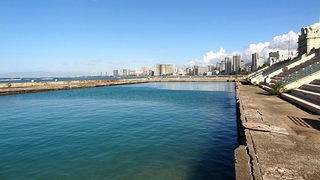 A reversal from the city's earlier plan to demolish the site, the new alternative has been vetted with technical experts with a focus on protecting its defining features—stadium seating that overlooks Waikīkī and a 100-meter, ocean-fed swim basin surrounded by perimeter decking. The proposal also allows for a natural flushing of sea water, to stay true to the natatorium's original 1927 underwater design. Equally important, the city's plan is fiscally prudent, as a new evaluation found that rehabilitation ($25.6 million) would cost less than demolition ($28.8 million). 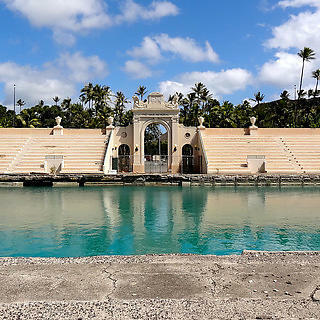 By modifying its plan, the city recognizes that the natatorium is an integral part of Hawaii’s historic and cultural heritage, and that its demolition would not be consistent with local, state, or national preservation policies. The National Trust continues to advocate for this solution to ensure that the natatorium is able to operate as a vibrant aquatic facility and community resource once more. Return to the Waikīkī Natatorium to its status as a vibrant aquatic facility and world-class public amenity. 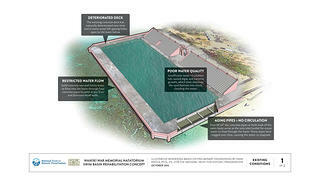 Donate to our campaign to save the Waikīkī Natatorium War Memorial. 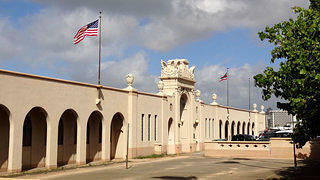 Preservation Magazine Can Honolulu's War Memorial Natatorium Be Saved?